Dark chocolate covered tree peeps. Everyone's favorite tree shaped marshmallow peeps covered in dark chocolate with a mint flavoring. A tasty spin on Christmas peeps. We also have milk chocolate cover mint tree peeps. Each box has 24 dark chocolate covered peeps. 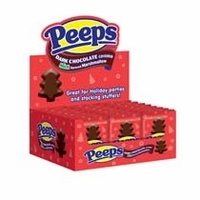 These are perfect to place in your Christmas stocking or give a whole box as a Christmas gift for that peep lover.